It's been a while since we last made a trip to Strangereal on PlayStation. The Ace Combat series has a long and relatively complicated history of releases scattered across a wide range of formats, resulting in a somewhat fragmented state. Fans largely agree, however, that the PlayStation 2 entries - 4, 5, and Zero - are the collective high point, after which things began to stall and take a bit of a nosedive. 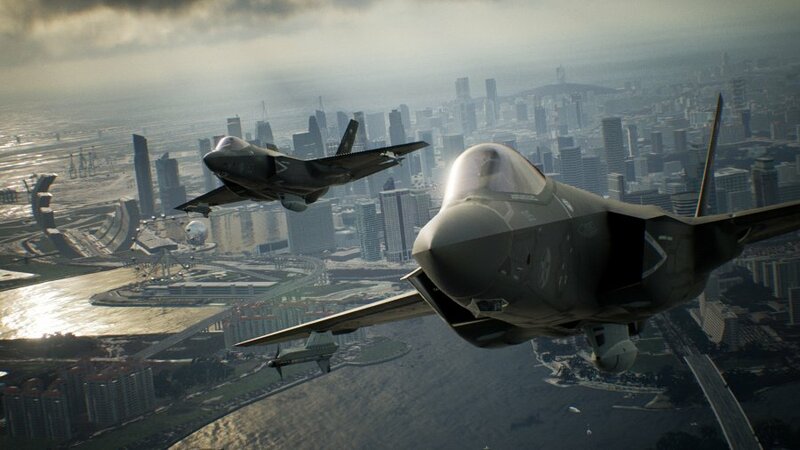 With Ace Combat 7: Skies Unknown, it's fair to say that Bandai Namco has brought its series back with a bang on PS4. 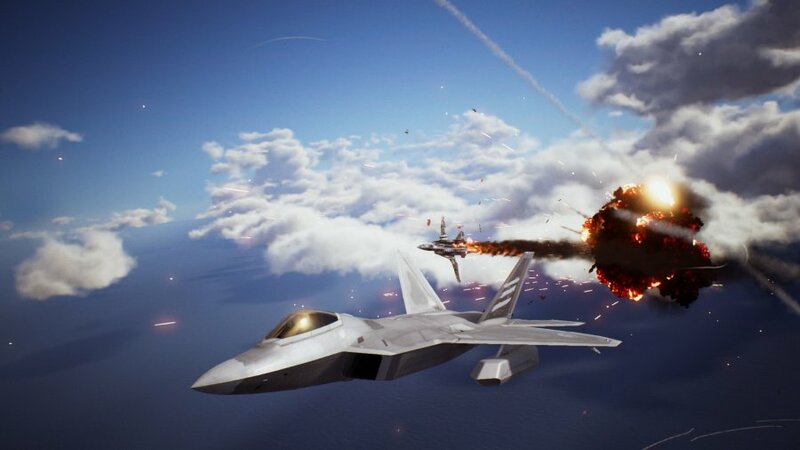 Much like its predecessors, Ace Combat 7 is an arcade fighter jet action title with a penchant for explosions. You’ll pilot realistic planes with unrealistic handling in a made up world with a silly name that’s, yes, at war again. It’s quite the concoction, yet despite its parts seemingly at odds with each other, it somehow coalesces into something, well, daft, but also highly entertaining. The key to Ace Combat’s success is the marriage of its slick, arcadey gameplay to a melodramatic tale of warring countries, super weapons, and sci-fi technology. As with previous titles, the story here isn’t going to win any awards, but there’s definitely a certain charm to the hammy dialogue and brooding characters in the pre-rendered cutscenes. As always, the narrative serves up the usual anti-war themes, but it’s seasoned with plot threads regarding drones and machine learning that give the game a fairly modern taste. The biggest problem with the story is the characters; it’s hard to care about most of the cast when the majority of the dialogue comes via radio chatter during action-packed missions. With most of the voices largely interchangeable, it’s possible you’ll lose track of who’s who and what’s what. 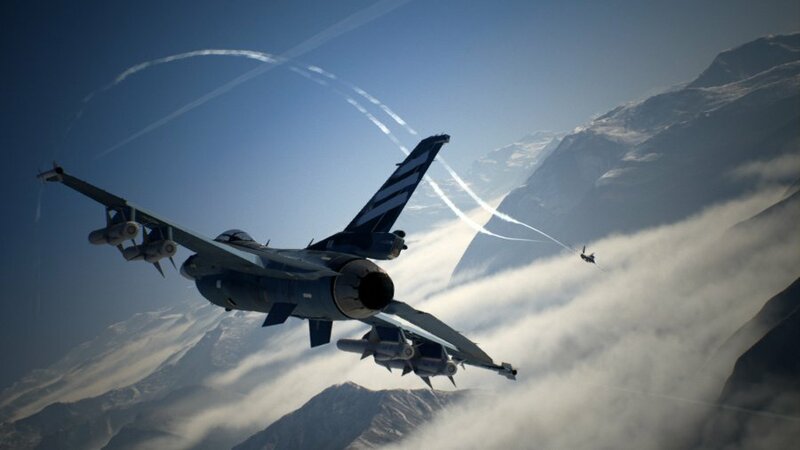 But let’s get down to brass tacks — the minute to minute action is the true star of Ace Combat, and it shines as bright as it ever has in Skies Unknown. Project Aces has practically perfected its unique brand of arcade flight handling that dips a toe into realism here and there. The emphasis is on slick flying and making you feel like an ace pilot, which the game achieves by providing you with fluid controls, countless enemy targets, and hundreds of missiles with which to shoot them down. In some ways, it feels like the Call of Duty of air combat. Like the popular FPS, Skies Unknown also runs extremely smoothly and features crisp visuals. The planes themselves are highly detailed, and naturally, the sky boxes in which you battle are gorgeous. 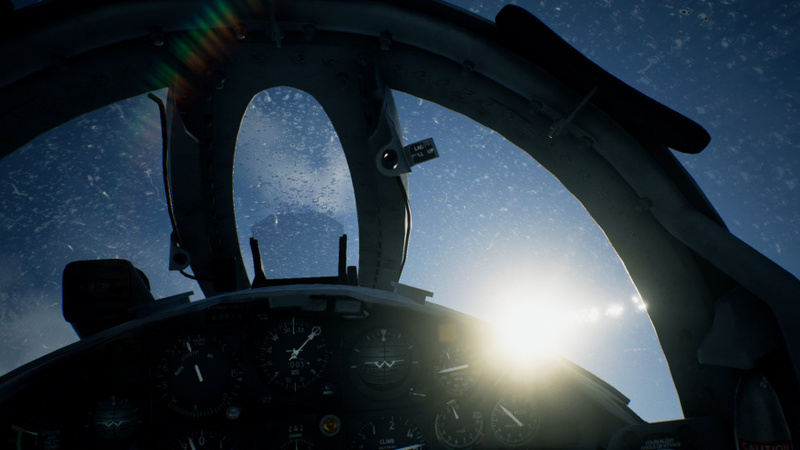 Physical clouds even add a new gameplay element by acting as makeshift cover if you have a bogey on your tail, and extreme weather conditions can play havoc with your aircraft. If we’re to level any criticism at the game’s looks at all, it would be the lack of detail on the ground. This might seem slightly unfair, considering you’re high in the sky a lot of the time, but many missions require you to deal with land based enemies, so it’s hard not to notice. Speaking of missions, there’s a decent variety of locations and objectives here. One memorable sortie sees your squadron approach an enemy base by flying through a valley at low altitude before launching a surprise attack, while another forces you to get close to unknown targets to determine whether they’re friend or foe before you bombard them. It’s a fun campaign overall, but some objectives can be a little frustrating. A few missions task you with reaching a certain score within a set time, which can result in some irritating losses if you’re struggling to meet the quota. However, completing each mission is satisfying, and you’re encouraged to replay them to improve your rank and earn more MRP. This is an in-game currency you’ll spend in the Aircraft Tree, a sprawling web of vehicles, special weapons, and stat-buffing parts. Chipping away at the tree is a necessity to stay ahead of the curve in the campaign, but all your unlocks carry over to the multiplayer, too, making those aircraft and upgrades twice as worthwhile to purchase. The multiplayer allows up to eight players to dogfight either in Battle Royal (free for all) or Team Death Match. While there are only two modes to play, the online seems to be pretty robust — we didn’t run into many issues at all, and it balances your aircraft’s loadout by assigning it a cost, which lobby creators can set restrictions on in order to prevent veterans from using top tier equipment. But what of Skies Unknown’s much talked about PSVR support? It’s been a major talking point since its announcement, and we’re glad to say that the end result is top notch. Set several years before the events of the main campaign, there are three missions to fly through in virtual reality, and if you own the tech, it’s well worth jumping into the cockpit and taking it for a spin. Controls are identical to the regular game, but you’re forced into a first person view, and although it doesn’t look as clean visually, it’s a very impressive effort that you’ll wish there was more of. 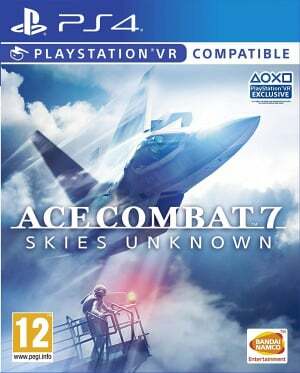 Ace Combat 7: Skies Unknown is a top entry in the long-running series that sees a return to the PS2 glory days. The war opera story is enjoyably charming, despite a rather flat cast of characters, while the gameplay is, crucially, as dramatic and slick as it's ever been. Online multiplayer and PSVR are both implemented well, and serve as great companion pieces to the main campaign. Whether you’re a diehard fan or coming to this game fresh, Skies Unknown is a joy, and a series highlight. Yesssss. So glad it's not a letdown! This is the most excited I've been for an Ace Combat in ages, maybe since 5? Awesome review Stephen! Haven’t played a jet fighter game since Afterburner. Maybe I will check this out, as my choice of games is becoming too conservative. Just about to install it. Heading straight to VR mode. Hope we can buzz the tower! @seanobi Correct, no PSVR multiplayer. If anyone has any other questions about the game, fire away! @Quintumply Thanks, you just saved me £50 What a let down. As soon as the clock struck midnight (UTC+1, since I live in Denmark ), I put on my PSVR, and selected the VR missions, and....... WOW!!!! First impression did definitelty NOT disappoint! Just to be clear, I've been a fan of the Ace Combat series ever since the very first game released on the original PlayStation back in 1995. I've played EVERY game in the series, and I've accumulated MANY "flight hours" in both the Ace Combat games, and simulators like Microsoft Flight Simulator - and on top of that, I'm a passionate planespotter. @JGEDK I think I've played all except Fires of Liberation. EDIT - Infinity too, really missed the boat, or plane (BOOM BOOM!) on that. I tried the VR demo, wow that was incredible ! My head is still spinning ! Nice, I still have a couple of games to play, but I'll get this after I finish my other games. I’m only really interested in the VR mode, so I’ll be waiting for deep discount. Wish the entire game was playable in VR. Good to see that the game turned out great. Started yesterday; loving it so far. Classic AC and the weather effects add a new aspect. My only disappointments thus far are that at least some skins have to be unlocked by playing multiplayer, and that an early twist on how you earned your strikea was spoiled by this very website a few months ago. So the impact was reduced as I knew what would happen. Can’t play VR yet as lack the tech needed but tried the demo at a convention and psyched to try that too. @KALofKRYPTON Trust me, didn’t miss much on Infinity. Didn’t take long before the repetitiveness, nickel & diming and attempts to control your gaming time came into play. I’m as big as they come for an Ace Combat fan, but I dropped it in like 3 months. After reading such an excellent review, not to mention some of the comments from others, this game is definitely on my LiDAR. @Quintumply Thanks for the review. Can you comment on the controller options - do you use the dualshock, or a dedicated joystick, etc? @VotesForCows You can play with a DualShock 4 or a joystick. I believe the only one supported on PS4 is Thrustmaster's T.Flight Hotas 4 joystick. Spent most of the day in VR mode. Absolutely incredible. They need to make more content for us. It’s such an amazing experience. So glad this turned out good. Probably going to download tonight! I figured this would be really good! Japanese developers just seem to be on a role lately (Capcom especially). I'm glad I pre-ordered this, though I'll probably play the AC5 pre-order bonus first for an extra bit of backstory and world building. Never played any AC games besides Assault Horizon and Assault Horizon Legacy, both of which I actually liked. This, Resi 2 and Kingdom Hearts 3 are coming out way too close for my wallet's liking. Will get it next month on Xbox One. It looks really fun.